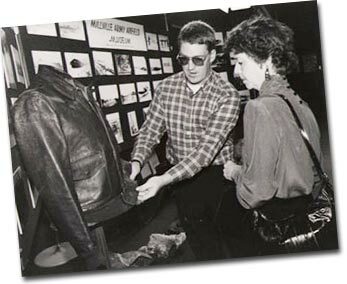 Museum founder, Michael T. Stowe and Frances Burt, examine her father’s leather “A-2” flying jacket. Her father, Second Lieutenant Lee L. Pryor Jr, died in an P-47 accident near Cedarville on May 2, 1945. Stowe explored those bunkers and surrounding areas and later began to find related artifacts. For nearly ten years, he continued to collect artifacts and information, and in 1983 he approached city officials about a permanent place at the Millville Airport to display his collection. Stowe’s original collection of artifacts and airfield data remains the cornerstone of the Millville Army Air Field Museum. The museum’s collection has grown through donations of time, effort, and artifacts from surrounding community and the community of veterans who served at the Millville Army Air Field. Today, both the museum and Millville Airport continue to grow and prosper through the Delaware River & Bay Authority’s management of the airport and the museum gaining recognition as a leader in World War II and post war aviation history.